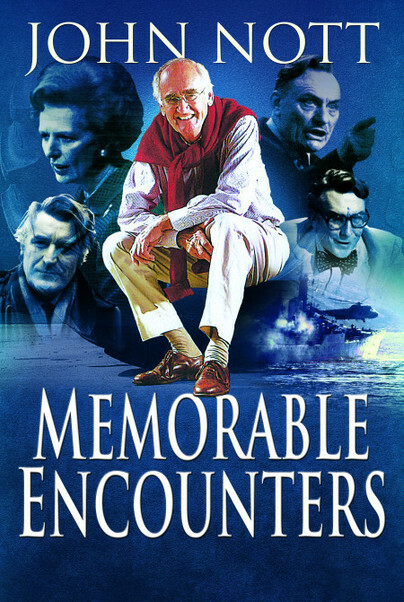 You'll be £12.00 closer to your next £10.00 credit when you purchase Memorable Encounters. What's this? During his varied career John Nott has encountered numerous interesting people, some household names and others well-known in their field. In Memorable Encounters he has selected twenty individuals to discuss and reflect on their contribution. His seventeen years as an MP, latterly as a Cabinet Minister, brought him into contact with leading politicians, including Enoch Powell, Margaret Thatcher and Norman Tebbit. While Defence Secretary during the Falklands War he worked closely with Admiral Lewin and General Bramall. As a young officer he served with the 2nd Gurkhas and, through a profile of Humbahadur Thapa, he describes his experiences with these stalwart soldiers. Nott’s principal career was in the City and he describes the role Siegmund Warburg played in his life. To add variety and spice, the Author includes personalities whom he came across during his education, farming in Cornwall and pursuing his interest in fishing. Additionally he describes his friendship with impressive characters including Ted Hughes, the Poet Laureate, and Martin Rees, the Astronomer Royal. Robin Day, whose interview he famously walked out of, features as does Nigel Farage. The book is dedicated to Miloska, his wife, whose story is worthy of a work of its own. All these characters and more make Memorable Encounters an unforgettable read. An interesting book all round. All in all this is a great read from a very interesting man. John Nott, former defence secretary who resigned after the Falklands War, is a lively and opinionated former politician. A former soldier and businessman, and later an MP, he has written Memorable Encounters (Pen & Sword) about twenty individuals he has known from Cabinet ministers, to heads of the armed forces, scientists, a Poet Laureate, a farmer and not least his wife. John Nott, former defence secretary who resigned after the Falklands War, is a lively and opinionated former politician. A former soldier and businessman, and later an MP, he has written Memorable Encounters about twenty individuals he has known from Cabinet ministers, to heads of the armed forces, scientists, a Poet Laureate, a farmer and not least his wife. John Nott’s career in politics and business has given him a unique perspective on some of the key events in British public life during the latter part of the twentieth century and on the revolution which has taken place in the affairs of the City of London. He was educated at Bradfield and Trinity College, Cambridge. Between 1959 and 1966 he worked in the City for SG Warburg, before entering Parliament at the 1966 General Election as MP for St Ives, a seat he represented for the next seventeen years. He served as a Treasury Minister in the Heath Government, and sat in Margaret Thatcher’s first Cabinet, initially as Trade Secretary and then as Defence Secretary. He left politics in 1983 to return to the City.